When using the insert method, insert a strip of the silver-base filler metal in the joint before assembly. Before brazing the parts, clean them with emery cloth, steel wool, or an acceptable cleaning solvent. Apply flux with a brush. Next, fit the two parts together and align them. Then light the torch and direct the heat on the tube or thinner portion, as shown in figure 3-46. The lines drawn on the tube indicate the path of the torch while heating the tube. Heat applied to the tubing causes it to swell and bring the surface of the tube into contact with the inside surface of the fitting. This closes the clearance area, forcing the flux from either end of the joint. Be sure to heat the entire circumference of the tube until flux begins to flow. Flux flow tells you that the tube has expanded sufficiently. This is the signal to proceed to the second phase of heating. 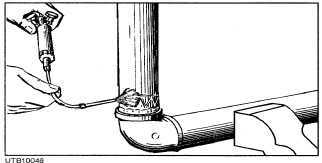 As soon as the flux flows freely, about 6 seconds after you see the fluid, direct the flame to that portion of the fitting hub farthest from the junction of the tube and the fitting. Rotate the flame over the joint segment until brazing filler metal appears at the junction of the pipe and fitting. At that moment, flick the torch away so the flame wipes toward the pipe. This completes one segment of the joint. This procedure is repeated until all segments are completed. A satisfactory joint has a continuous ring of filler metal at the end of the fitting. The ring must also be smooth and concave. With the feed-in method, the parts are heated to the correct temperature. Watching the behavior of the flux is the best way to determine the temperature of the joint as the heating progresses. First, the flux dries out as the moisture (water) boils off. Then the flux turns milky and starts to bubble at about 600F. Finally, it turns into a clear liquid at about 1100F. This last temperature is just short of the brazing temperature. The clear appearance of the flux indicates the time to start adding the filler metal (silver solder). If the temperature and alignment are proper, the filler metal spreads over the metal surface and into the joint by capillary attraction. Make sure the filler metal penetrates the complete thickness of the metal for good bonding. Stop heating as soon as the filler metal has completely covered the surface of the joint. Then allow the joint to cool before moving, so the filler metal solidifies. A number of different types of equipment are used in silver brazing. In your work, silver brazing can be accomplished by the use of methylacetylene propadiene (MAPP) cutting/welding equipment. A commonly used oxygas welding outfit (fig. 3- 47) consists of a cylinder of acetylene or MAPP gas or a cylinder of oxygen, two regulators, two lengths of hose with fittings, and a welding handle with tips. An oxygas outfit also is called a "welding rig." In addition to the basic equipment mentioned above, numerous types of auxiliary equipment are used in oxygas welding. A very important item is the spark igniter that is used to light the torch (view A, fig. 3-48). Another item you will use a lot is an apparatus wrench, the same or similar in design to that shown in view B, figure 3-48. The apparatus wrench is sometimes called a "gang wrench" because it fits all the connections on the welding rig. Note that the wrench shown has a raised opening in the handle that serves as an acetylene tank key. Other common accessories include tip cleaners, cylinder tracks, clamps, and holding jigs. Safety apparel, such as goggles, face shields, gloves, leather aprons, sleeves and leggings, also is essential and should be worn as required for the job at hand. Figure 3-46. - Applying heat for brazing a tube and fitting. Oxygas welding equipment may be stationary or portable. A portable oxygas outfit, such as that shown in figure 3-49, is advantageous where the equipment must be moved around from one job to another. To carry out your welding duties, you should understand the purpose and function of the basic pieces of equipment that make up the welding outfit. Before discussing the apparatus, look at the gases used in gas welding, particularly MAPP gas and oxygen. MAPP GAS. - MAPP gas is an all-purpose industrial fuel that has the high-flame temperature of acetylene and the handling characteristics of propane.